While 10 varieties of cheeses might sound like a lot, naming only 10 French cheeses is a feat. There are so many excellent French cheeses; it's estimated that France produces approximately 200 different types of cheeses! Cheese is one of the staples of French food culture alongside bread, pastries, and wine. Whether you have a light cheese spread on your morning bread, a hard cheese in your baguette at lunch, or a potent after-dinner cheese following a delectable French dinner, cheese is a central element of the French diet. In fact, so central is cheese to French food that it often has it's own course at a meal! Breaking the cheeses down into the categories 'soft' and 'hard' is a good way to get oriented. Generally speaking, soft cheeses are for real cheese lovers; if your taste for cheese doesn't go far beyond sliced American cheese, skip down to the section on hard cheeses. For the cheese lover, or for the food adventurer, trying some of these soft French cheeses can be a good way to become absolutely addicted to the finer tastes of France. Blue cheese is one of the headier French cheeses, but doesn't have to be. Roquefort, made with sheep's milk, is a quite dominant blue cheese flavor. 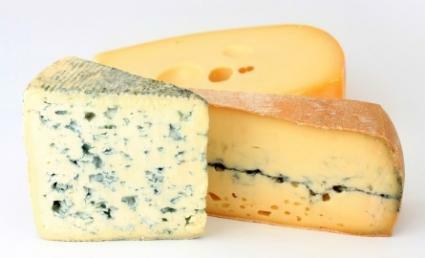 On the lighter side, Bleu d'Auvergne, made from cow's milk, has a lighter flavor. Both variants are distinctively blue cheese, but these two variants (among many, many more variants of blue cheese), show that not all blue cheeses are created equal. Goat's cheese is another popular cheese among cheese lovers, and just like blue cheese, goat cheese comes in many different varieties in France. The youngest goat cheeses are pale white and quite soft in flavor; the older cheeses darken on the outside and become stronger in flavor with age. Most goat cheeses come in small round circles, often called crottin (de chèvre), but some goat cheeses are made in logs, such as the complex-flavored Saint-Maure de Touraine. Boursin is a commercial brand of herbed/garlic soft cheese, but in French cheese shops you can find non-packaged versions of this garlic-lover's delight. The key word when asking a shopkeeper for this type of cheese is ail (garlic). Or, simply purchase 'Boursin' at a French supermarket; if you've ever bought it in America, you'll be joyously surprised by the French price tag! Brie is one of the most famous of the French cheeses, perhaps alongside camembert. These two are two of the most commonly exported cheeses; many variants of brie and camembert can be found in supermarkets around the world. Of course, getting a fresh brie in France from a fromager and getting a world-class baguette at a nearby boulanger is the perfect start to a perfect picnic evening. Don't forget the wine! While brie varieties come from the region around Paris, camembert cheeses are native to the region of Normandy. Camembert is aged for less time than brie, so if you've ever tried brie and found its flavor to be too strong, giving camembert a try is a good idea. This soft cheese native to the northern regions of France is the original cheese from which cheesecake was first made. Of course, it's also tasty on bread! This cheese is harder than many soft cheeses, but not considered a hard cheese by any stretch of the imagination. A very ripe odor makes this cheese one of the 'smelliest' of the French selection, but the flavor is softer than the smell would have one believe. Emmental originated in Switzerland and is one of the very lightest of the French cheeses. If you order a sandwich with cheese, this is the type you're likely to get. Even for those who don't love cheese, there's nothing better than walking the streets of Paris with a baguette beurre-fromage or a baguette jambon-fromage. Sometimes likened to cheddar, this French cheese can be found in two varieties, either made with pasteurized milk (Cantal Laitier) or with raw milk (Cantal Fermier). The length of aging influences how sharp the flavor of this hard cheese is. From the northern border of France, made in the region of the town of Lille, Mimolette is a French cheese that was originally made to mimic the Dutch cheese 'Edam'. It was at the request of Louis XIV that farmers began making this variant of hard cheese. Like so many of the 10 French cheeses introduced here, the aging time (ranging from only two months to two years) has the biggest influence on what the final product tastes like. French dining etiquette prescribes that cheese be served as a separate course, after the main course, before dessert and coffee. Common custom is to take some of each cheese from the cheese platter and put it on your own plate as it is passed around the table; you will not see the French reaching into the center of the table to cut each piece of cheese. Serve yourself as the platter goes around the table, and after everyone has been served, give it a taste! If you like it, ask for the platter to be passed again. The French will be delighted that foreigners like their cheeses so much!